When Captain Robert M. Madison eased himself into the pilot’s seat behind the controls of his Boeing B-29 Superfortress on July 21, 1948, he had no idea this would be the last time he would ever helm this aerial behemoth that would soon have himself and his four-man crew soaring to an ear-popping altitude of 30,000 feet (9,100 metres) as part of a classified military program called Sun Tracker. Why the ominous intro alluding to disaster? Because hours later that sibling of the Enola Gay and Bockscar B-29s that dropped the atomic bombs on Japan, not to mention the intercontinental ballistic guidance system it was testing, would be under more than 250 feet (76 metres) of murky water at the bottom of Nevada’s Lake Mead. There it would remain a military secret, undisturbed and relatively unknown, for 50 years. In 1998 the crash was officially acknowledged by the U.S. government, and within three years the exact location had been pinpointed in the Overton Arm area of the lake by diver Gregg Mikosalek and his team using sidescan sonar. “It is a moment in time that is captured. 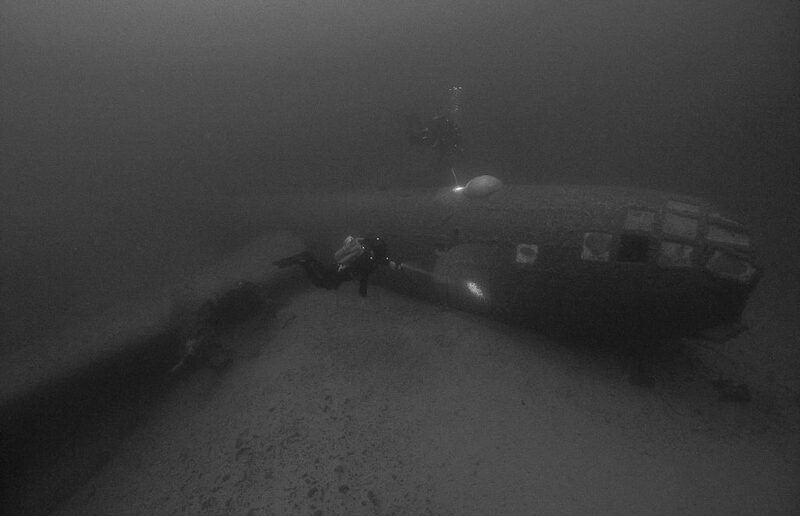 Every control in the cockpit is exactly in the same spot it was when the plane crashed,” begins Scuba Traning and Technology’s (STT) Joel Silverstein, a veteran of more than 100 dives to the crash site. Silverstein and STT were granted a very restrictive permit to dive the site for a two year period back in 2007 for a short initial test run under the very watchful eye of the National Park Service (NPS), which issued the permit and has control of the site since Lake Mead is a National Recreation Area. It is safe to say that freshwater mussels were definitely not on the proverbial radar back on that fateful July day in 1948, when the crew of the propeller-driven B-29, secure in their pressurized cockpit (a definite selling feature of the aircraft and a requirement for Sun Tracker testing since it involved repeated rapid high to low altitude dives) levelled the plane off at a 30,000 foot plateau and began a swift, purposeful descent towards Nevada’s remotely situated Lake Mead. The B-29 eased up 300 feet (91 metres) above the lake’s sun-glistening surface. When the pilots misjudged the plane’s clearance above the water due to the blinding reflection, their flying Superfortress was soon having three of its four engines torn off as it skimmed across the lake like a 250 mph (400 km/h) skipping stone. When the plane eventually settled on the water in a nose-up position the five crew members were able to escape to life rafts and await rescue as they watched the B-29 and its classified cargo sink before their eyes. 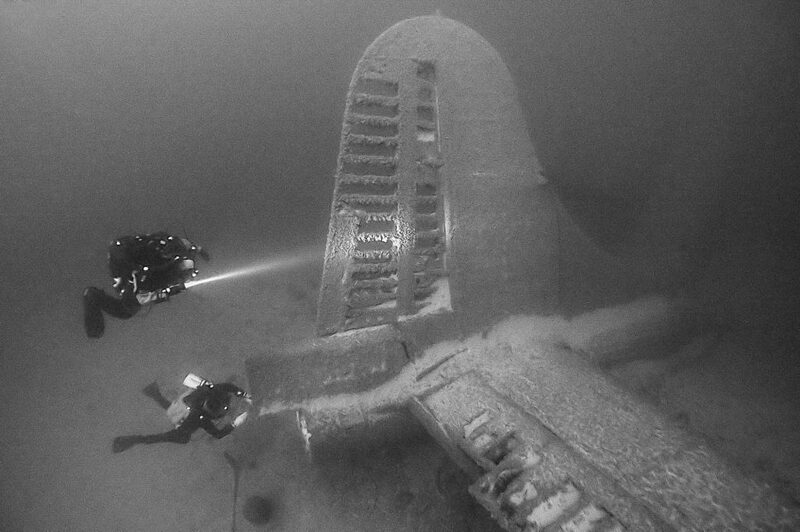 Scuba Training and Technology was again selected by the NPS in 2015 to guide divers to the B-29’s final resting place with a permit that is set to expire after the 2017 dive season. 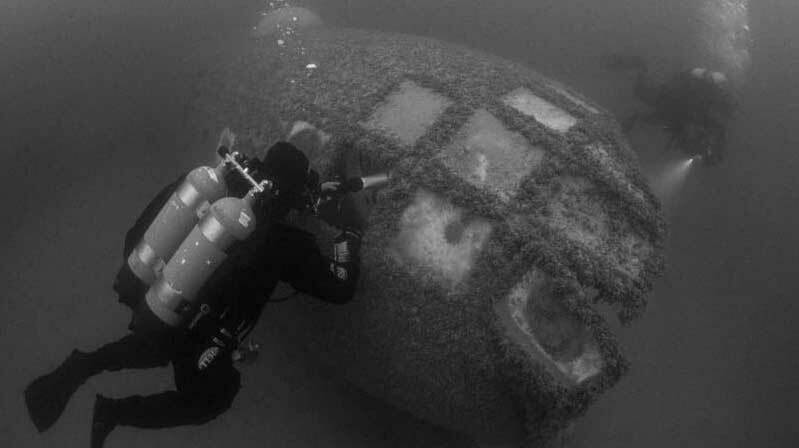 Two divers who have taken advantage of that opportunity are Cindy Shaw and her maritime archaeologist husband Patrick Smith, who have both dove to the B-29 wreckage three times. And while Smith shares his wife’s enthusiasm for the impressiveness and spectacle of being able to view the B-29 wreckage in person, the maritime archaeologist in him knows the quagga mussels that have caused damage to the plane in recent years will continue to do so as they proliferate on the breeding ground that is the canvas-like outer construction of the Superfortress. As for who can safely visit the crash site, Joel Silverstein estimates the B-29 sits in just 110 feet of water now as years of drought take their toll on Lake Mead and the surrounding area. 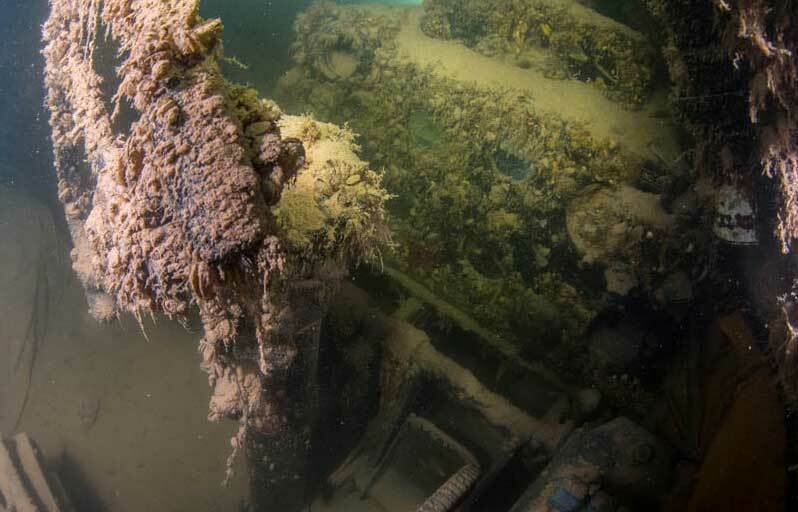 Because of this, recreational divers can now have guided access to the wreckage, which Silverstein sees as an opportunity for those who wouldn’t have been qualified to dive the site ten years ago to take advantage of the potential opportunity. “To have this particular site intact in Lake Mead accessible for people to see, in a National Park, it’s quite wonderful,” he says. See more photos in of Cindy Shaw’s Flickr Album and on Brett Seymour’s website.